And did you get what you wanted from this life, even so? I did. And what did you want? Do you feel a kindred connection to the Earth as a teacher, medicine and the clearest mirror for your highest self, yet need guidance to take this further? Do you feel a yearning for inner connectedness, yet the pull of daily demands knocks you off your center? In our current society, it can be difficult to stay in alignment with our truest self and deeper calling. Our unique gifts can become shrouded, pushed aside or forgotten. Many of us have so much to offer, yet lack the spiritual and emotional support of like-hearted community that we need to actualize our fullest potential. We can feel the desire to cultive a sustaining, intimate connection with the natural world and our true self, yet not know where to start. ~Imagine being guided to deeply connect with nature and the woman you know yourself to be. ~Imagine spending the whole year with the support of like-minded women and the luxury of time in beautiful places outdoors. ~Imagine being part of an intimate community that witnesses and appreciates you throughout the year. 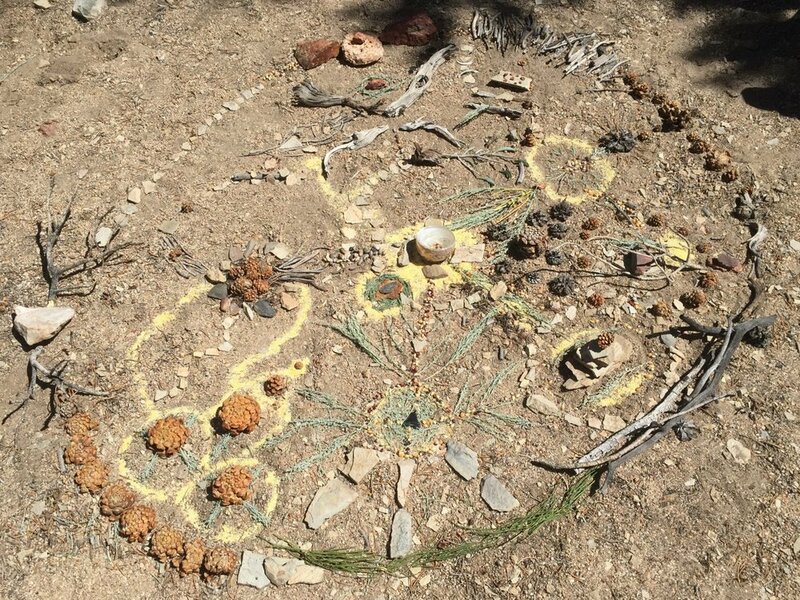 The intention of the Earth Spirit Circle is to create a close circle of women, steeped in sisterhood and time outdoors with the collective vision to be the fullest, truest expression of yourself. You will be a part of a community that gathers to create personal rites of passage in nature to return to that deep part of yourself that's been lost. You will learn practices so that you can become grounded and clear in your daily life. If you are a healing arts professional, you will learn new practices and tools that will likely benefit your practice. YOURSELF again. Joyful. Free. Grounded. Alive! The most authentic expression of yourself! Clearly connected to your purpose. More confident in your relationships and work in the world. Grounded in self-care and growth practices. A transformational journey is WAITING FOR YOU! 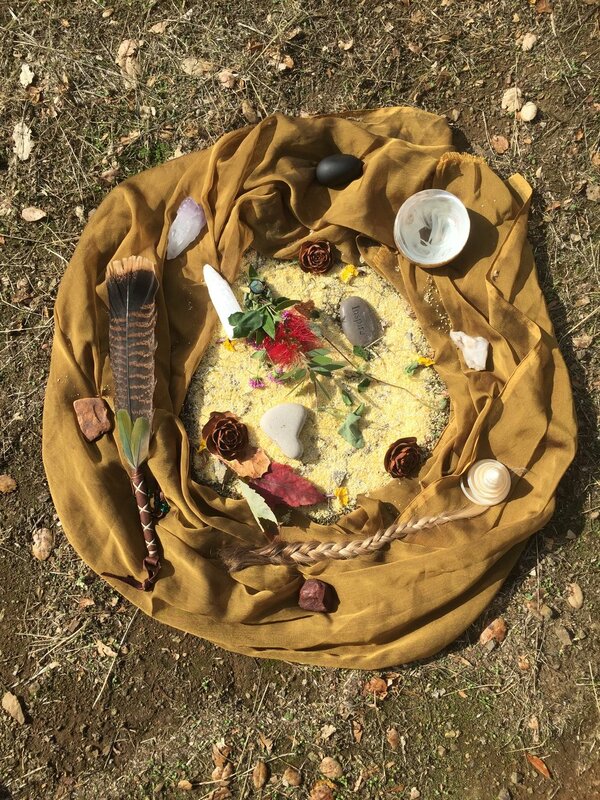 The Earth Spirit Circle brings together sisterhood, nature, and spirituality. In this magical blend you will be supported to experience yourself as whole, interconnected and loved. You will have a place where your inner riches can safely emerge, welcomed among peers in the beauty of the natural world. You will find your true ground so you can see new possibilities, navigate life's challenges or start new chapters! Building a community that will love and support you and your intentions, with monthly indoor meetings throughout the year. Your true self through a deep, sustaining connection with the Earth and have that reflected to you in a circle of women who are supporting and seeing the real you. 3 Nature Daylongs over the course of the four seasons in the same location to cultivate a sustaining relationship to place. 18 Indoor Meetings throughout the year to create continuity and community, and to learn nature based and spiritual practices. A 3 Day Nature Retreat, with solo time and fasting, where you will create your own personal rites of passage to explore your wishes and intentions for the year. A 9 Day Wilderness Journey, with solo time and fasting, where you will be supported by the group and the practices you’ve been learning to prepare for a multi-day solo; you will participate in a fire ceremony, offering to the fire what you want to transform in your life; you will claim a life change you are ready to make, ask important life questions, and receive the nurturing and solace of the natural world. A Sweat Lodge Ceremony to inspire and honor your commitments for your life ongoing. A 2 Day Culmination Retreat to celebrate your growth over the course of our year together. Meditation practices to build awareness and groundedness for your daily life. Exercises to access your creativity through art and movement. Authentic self expression through embodied spiritual exercises and nature connection exercises. Rituals to build Earth honoring practices into your daily life. How to safely prepare on a physical, emotional, mental and spiritual level for the Daylongs, Nature Retreat and Wilderness Journey. Connection and bonding exercises so that you are a part of a long lasting, true sisterhood. What makes this women’s circle stand out amoung the many support groups and outdoor experiences out there? 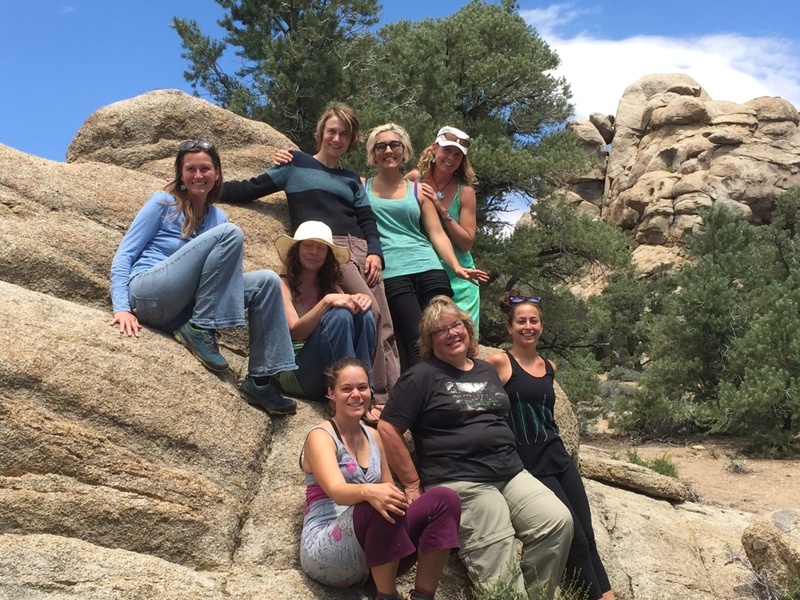 Most women’s groups run by therapists don’t have the outdoor component because it is a unique and rare skill set to also be trained as a wilderness rites of passage guide. Most vision quest like experiences and personal growth outdoor trips don’t have the component of a long term group. Usually they are one-off experiences that don’t offer this level of sustained support and guidance. Women will have huge transformations on a one time trip but won’t be able to sustain the transformation because they lack community and a dedicated guide to track their journey beyond the trip. 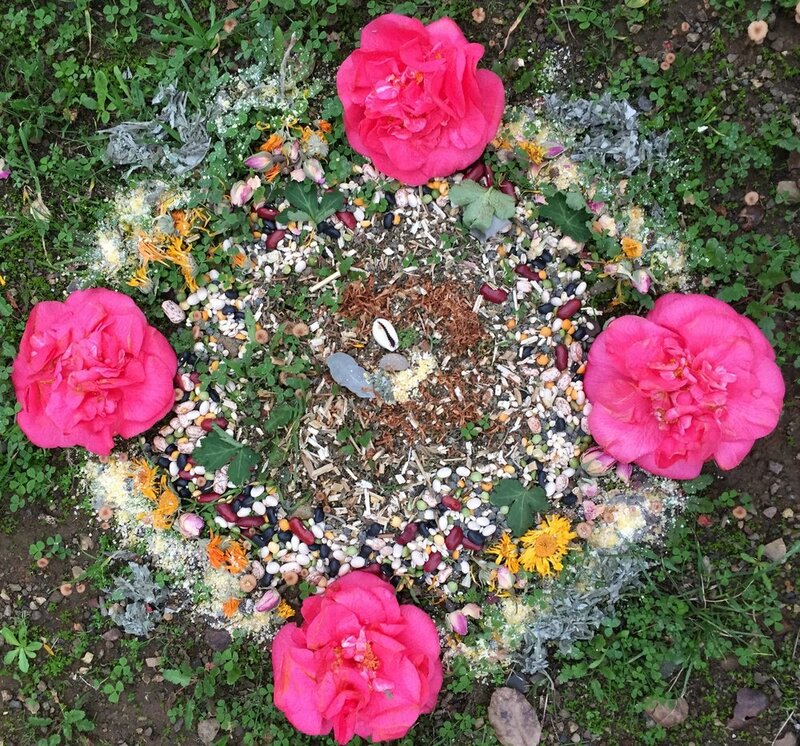 The Earth Spirit Circle begins with an outdoor daylong in peaceful West Marin, April 2nd 2016. This group is limited to 7 amazing women. In order to create a strong container for your growth and exploration, I am committed to ensuring that each woman is a good fit for the circle. There is an application process where each woman will be personally interviewed by me. Amy Biesemeyer, Licensed MFT has been guiding women in gorgeous outdoor settings since 2004. Her deep love for the natural world was born in 1994 when she backpacked throughout California for eight weeks, studying Ecopsychology. She is especially passionate about working with groups of women and has deeply explored her own womanhood through facilitating and participating in women's therapy groups and earning a BA in Women's Studies. She trained with the School of Lost Borders, holds a Masters in Somatic Psychotherapy from the California Institute of Integral Studies and is a Wilderness First Responder. In addition to her work as a wilderness rites of passage guide and trainer, she draws upon her experiences from being a student of Jennifer Welwood, The Diamond Heart Approach and Somatic Experiencing. Nature is her teacher and sanctuary, and she is honored to guide others in the magical unfolding of their inner wilderness. I will be assisted by Michele Angelini who completed the Somatic Ecopsychology Apprenticeship Program with me. I will also have an apprentice, Alaya Babineau, who also completed the Somatic Ecopsychology training program. What does this mean for you? It means that you will have three amazing women guiding you to ensure your safety and growth throughout the year. Michele Angelini's depth of growth has been guided in the arms of Mother Nature. She received her Bachelor degree in Psychology from SUNY Brockport. She furthered her education in California from JFKU completing her Masters degree in Consciousness and Transformative Studies focusing on indigenous studies, holistic health and how nature guides our purpose and transformation. Upon graduation, she completed a 6 month long Somatic Ecotherapy Wilderness Guide Certification, which entailed the preparation and integration her own 4 day solo nature fast. This later inspired her to journey on a 28 day nature solo in the mountains of Crestone Colorado. She continued her education in the PhD program East-West Psychology, at CIIS with an interest in psychedelic plants, rites of passages, and somatic studies. She is also the apprentice for the 2018-2019 Woman's Earth Spirit Circle, and is honored to return as the assistant for the 2019-2020 Circle. Alaya Babineau has been passionately devoted to conscious touch and embodiment for over 27 years. A certified practitioner in Massage Therapy and Biodynamic Cranial Touch, Alaya taught the Foundations of Touch for Harbin School of Massage and a practitioner at Harbin for 20 years. She currently teaches Soul Food: Cleansing, Reconnection and Transformation Retreats. Her life-long and very deep relationship with the natural world has inspired Alaya’s personal journey and teachings. 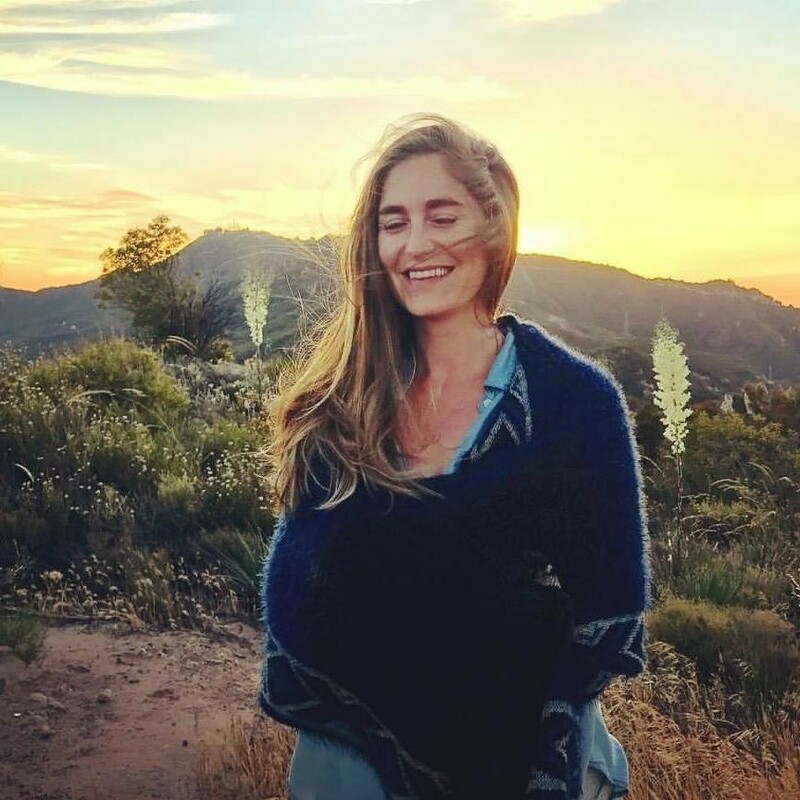 She is a recent graduate of the Somatic Ecopsychology Apprenticeship program with Wilderness Reflections, which has deepened her knowledge in re-connective education through Vision Quest and Community Council. Alaya’s ardent desire for embodied living, blended with a deep curiosity as to the many ways Source expresses through us, inspires her ongoing evolution as a practitioner/teacher inspired by Continuum Movement, Kashmiri Slavism, embodied meditation, aquatic bodywork, Breathwork, vegan and living foods and spending plenty of time in nature. "I would compare my experience of before and after I joined the circle to being like a caterpillar on its way to transformation into a beautiful butterfly. When I first joined the circle, I was moving through life well but not letting the world fully see who I truly was. Joining the circle allowed me to enter a safe cocoon of support and self-reflection where I slowly began to emerge as a beautiful butterfly. Amy’s process of creating a safe environment for self-challenge and self-growth has enabled me to step beyond my comfort zone and get to know the deepest parts of my soul. The combination of her guidance and being in nature helped me come home to myself in way I’ve never found possible before. “Throughout our year together, Amy and my earth spirit sisters witnessed and supported me as I went through one of the greatest transformations a woman can go through- becoming a mother. The support of the group was an essential part of my personal growth, but so was my solo time in nature. Being alone out on the land was a true gift that helped me connect to myself and the great earth mother in a deep and spiritual way. We will meet in Marin County for the Thursday meetings and Daylongs. The Retreat and Wilderness Journey will take place in the greater San Francisco Bay Area. Exact locations to be given upon registration. Feeling called to join this transformational Circle?! Then I would love to talk with you! There is an informal interview so that I can ensure group compatibility. Click here to contact me so that we can start the process.